Pandora is a free Internet Radio app, which learns the type of music you like. 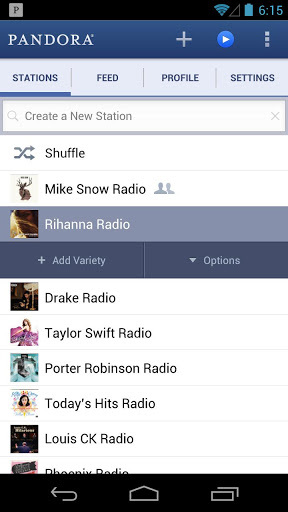 Whether you have an Android, Apple or are just a PC user, Pandora has you covered. Even my Samsung TV and TIVO DVR have Pandora apps. Pandora requires a data connection to stream music, and is best used over WiFi to avoid extra data charges on your mobile device. Pandora is best when it knows you well and has been tuned over a period of time. 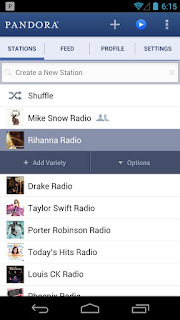 Using the same Pandora account between all your devices and eventually you can build the perfect station. By "Adding Variety", adjusting the "Options" for your stations and using Thumbs Up/Thumbs Down liberally Pandora will learn what music you really like. On your desktop, no app is needed, just go to their website to get started. Recently Pandora has set a 40 hour listening limit on mobile devices. You can skip up to six songs an hour and twelve songs a day. 15 second ads are played every 30-60 minutes. By upgrading to Pandora One for $36 a year or $3.99 a month and can avoid the listening and skip daily limits, and your music will never be interrupted with ads.